Bangalore: Finance minister Pranab Mukherjee on Sunday said headline inflation in the country remains “perilously close" to double digits but is expected to moderate to 6-7% by March if the present declining trend continues. “I do hope if this trend continues, then the year-end inflation... by March will be 6-7%," he said. Food inflation fell sharply to a four-year low of 4.35% in the week ended 3 December from 6.6% in the previous week, while headline inflation moderated to 9.1% in November from 9.7% in the previous month. Talking about the global slowdown, Mukherjee said, “It’s true that we are going through difficult times, not only in India, but also all over the world." Mukherjee said as per another assessment, there has been slow recovery in the US economy, but “how long it will continue and how far it is, is yet to be seen". “The same is the story with Japan," he said, adding that the growth rate in many emerging economies has come down and the rate of inflation is also high in these countries. 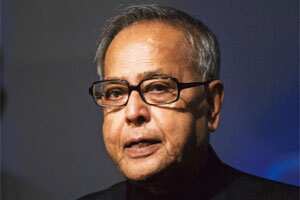 “In that context, we are also facing problems," Mukherjee said.